Each day this week, I'm spotlighting a Charlotte-area person or organization that is making black history. When you think of touring a city, you might view this as something for out-of-towners. But for cities like Charlotte in which there are so many transplants, many of us could benefit from a guided tour of this city we call home. Since 1993, Queen City Tours has been leading groups on journeys through Charlotte's rich history. The company offers a variety of tours ranging from its traditional daily city tour, a NASCAR tour, and ghost tour to its cutting-edge Segway tour, where you cruise the city on the two-wheeled vehicles. 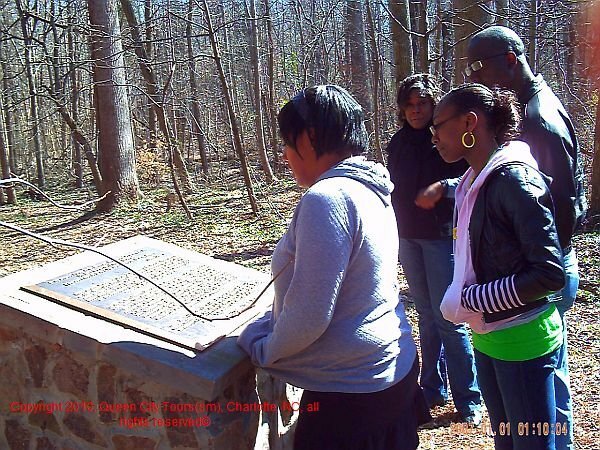 And one of the most popular among the tours offered is the Charlotte Black/African-American Heritage Tour. A group reads an historical marker during one of the Pilgrimage tour stops. On the African-American Heritage Tour, guests are taken on a two-hour-plus tour that includes more than 75 sites that are significant to black history. Those include touring three historic black neighborhoods (Washington Heights, McCrorey Heights, and Biddleville), Johnson C. Smith University, the old Good Samaritan Hospital, Dr. Martin Luther King Jr. statue, The Excelsior Club, and more. This tour is offered daily. And each February, Queen City Tours presents its annual Pilgrimage, which it's been holding for the last 13 years. Each Saturday during Black History Month, the company leads groups on a special tour through Charlotte and Huntersville, highlighted by visits to former slave churches and cemeteries. The final edition for this year's Pilgrimage is this Saturday, February 26, offered at 10 a.m. and 1:30 p.m.
For more details on these great tour opportunities, visit queencitytours.com. $10 OFF Seats Expire 01/31/2012!! !